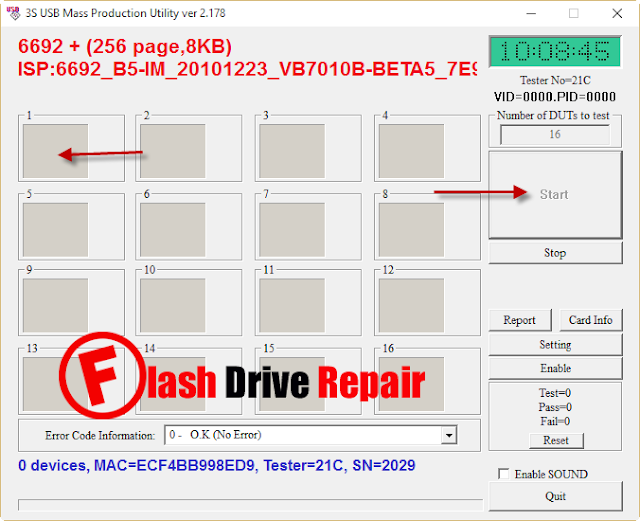 Download 3S USB Mass Production Utility v2.178 to repair corrupted SSS chip controllers . SSS MP utility v2.178 can fix SSS6677, SSS6679, SSS6686, SSS6688, SSS6689, SSS6690, SSS6691 and SSS6692flash drive chip controllers . 3S USB Mass Production Utility v2.178 has been designed to format corrupted SSS chip controllers .3S MP utility v2.178 can help you to repair the following SSS USB flash drives controllers "3S6677,3S6679 ,3S6686 ,3S6686 ,3S6688 ,3S6689 ,3S6690,3S6691 and 3S6692 chip controller . 3S USB Mass Production Utility ver2.178 can fix SSS format errors such as Write-Protected flash disk ,Please insert Disk error message , No media error Message , Small capacity of flash disk 0MB or 15 MB ,Windows unable to format disk ,Unrecognized USB flash drive and other format issues . You must be sure that your USB flash disk is SSS chip controller with the SSS models we mentioned before .To determine your flash drive information , please read this articles first " Chip genius software or USB Deview V2.30 utility. Please Read this article to know how to extract your flash drive information "How to repair corrupted flash disk " . How to repair 3S USB flash Disk ? First Download 3S MP utility v2.178.rar files from the download links below . Insert corrupted SSS USB Pen Drive to your Computer . Extract 3S MP utility v2.178.rar and open U3S_MP_V2178.exe . If your USB flash disk is supported ,you will see flash disk information appears on the software interface . Click Start to begin the update process of your flash disk . Is there any hope for sss6698? como se repara esta memoria y si no tiene arreglo . o me explican como extraer el firmware de la memoria usb con otra de esas mismas referencias. muchos saludos a todos gracias.